In the late 1960’s, nutrition labeling began on foods considered to meet special dietary needs, such as sodium content for those wanting to monitor their intake. 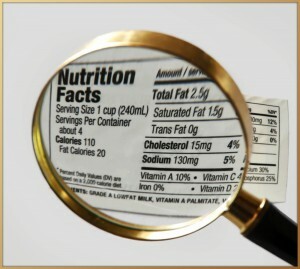 Voluntary nutrition labeling under FDA regulations began in 1972. In 1990, nutrition labeling for most prepared and packaged foods became mandatory. To this date nutrition labeling for some foods, such as seafood and fresh produce, remains voluntary. Due to the fact that FDA guidelines have not changed in over 20 years and in response to consumer interest, the FDA recently announced plans to revise nutrition labels sometime this year. Although the new guidelines have yet to be determined there is no doubt that changes, largely driven by The Center For Science In The Public Interest (CSPI), are long overdue. Studies have shown that people who regularly read nutrition labels choose to eat healthier foods. When nutrition labeling was originally introduced, most people were making their own meals and eating at home the majority of the time. The demand for information has intensified as a diet high in processed and pre-prepared foods has become standard fare. As concerns of obesity and diet-related diseases have soared, consumers have become increasingly aware of the nutritional affects of foods on their health and weight. Studies now show that 42% of adults aged 29 through 68 and 57% of adults aged 68 and older read nutrition labels most or all of the time. Clearly, knowing the nutrient content of foods has become very important to consumers who care about their health. What changes might we see? Until now, the focus has been on fat content. One important change will be to shift that emphasis to calorie content. Calorie count per serving and serving size may also be simplified, requiring less mathematical calculations to counter the confusing and often deceptive “servings per package” info currently used. The aim is to improve customer understanding of true portion sizes, allowing for better and healthier diet construction. Expect to see a larger or bolder font size highlighting the calories, serving sizes that make sense, and a shift away from the use of the metric system for measured ingredients. Attention will be drawn to added sugars. Under consideration are a highlighted and full disclosure of added sugar content, a recommended maximum daily amount, and, to make it easier for consumers to see all added sugars at once, a group listing of all added sugars. Currently no distinction is made between added sugars and the natural occurring sugars such as those found in fruits, vegetables and dairy products. The American Heart Association considers added sugars to be discretionary calories that the body doesn’t need for health or function and recommends limiting those calories to 150 per day for men and 100 per day for women. Added sugar is now considered a leading contributor to the obesity epidemic and obesity related diseases in the U.S.
To help consumers make smart decisions quickly, a recommendation is being made for standardized nutritional health symbols to appear on the front of packages. Loopholes may also be closed for misleading health-related claims such as “low fat,” as those foods typically contain unhealthy levels of sugar and salt. Standards need to be established for foods labeled “natural” to prevent manufacturers from using the claim when, for example, they add naturally occurring sugars to a product while the nutritional content remains poor. The percentages of key ingredients may be listed along with an improved format and easy-to-read font, especially for whole grains. Currently any amount of whole grain added to a product allows for the product to be labeled whole grain. New guidelines may include an actual percentage number between 1% and 100%. Ingredients known to cause allergies or sensitivities in some people may be listed separately from other ingredients, making them easier to find. Although it remains to be seen how many of the proposed label changes will be adopted, any changes that make it easier to track what we are actually eating and that enable us to make healthier choices will be seen as an improvement. Changes that draw attention to unhealthy and highly processed food ingredients may force manufacturers to eliminate the ingredients that consumers want to avoid and encourage them to include more nutritious ones that are better for our health. As Americans become increasingly aware of the impact nutritional choices have on our overall health, wellness, and longevity, hopefully more of us will choose healthier options. New labeling standards should endeavor to help us do just that. This entry was posted in Health & Wellness, Home and tagged Nutrition Labels. Bookmark the permalink.